Kelley was a beautiful doll. One reason, was Mattel used the very popular Steffie head mold. Kelley came in two models, #4221 Quick Curl and the rare Sports Set #7808 Yellowstone Kelley. Both dolls have brown eyes, painted eyelashes, twist waists, and bendable legs. Quick Curl Kelley has medium length curled red hair and Yellowstone Kelley has long straight red hair. 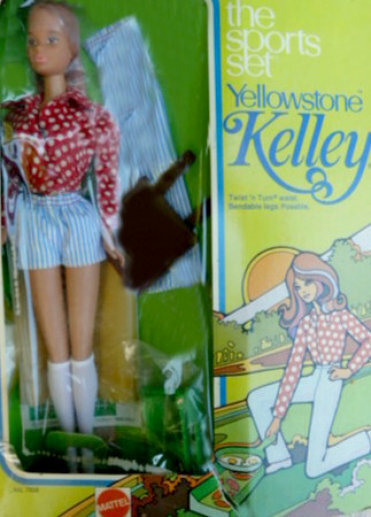 Yellowstone Kelley also has a suntan and she's the only one of the Sports Sets to be a "new" doll. 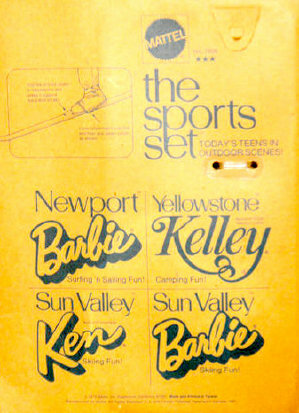 The other three Sports Set dolls were Sunset Malibu dolls dressed in different clothes. 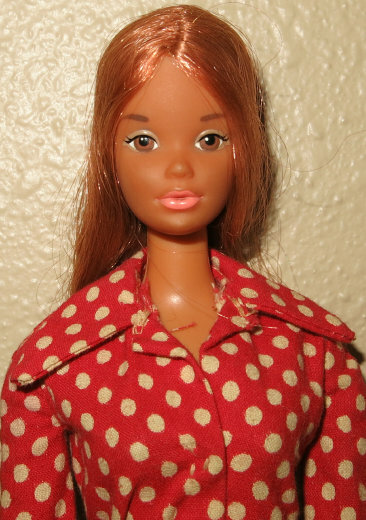 Both dolls are marked: © 1966 Mattel, Inc. U.S. & Foreign Patented Other Pat's. Pending Made in Taiwan. Here's what came in the box with #7808 Yellowstone Kelley: The complete set had a back pack, extra pants, yellow sleeping bag, camping mattress, camp stove,cooking utensils, pots and pans and a brush and comb. She came wearing striped shorts, red and white polka dot shirt, white knee socks, and white tennis shoes.